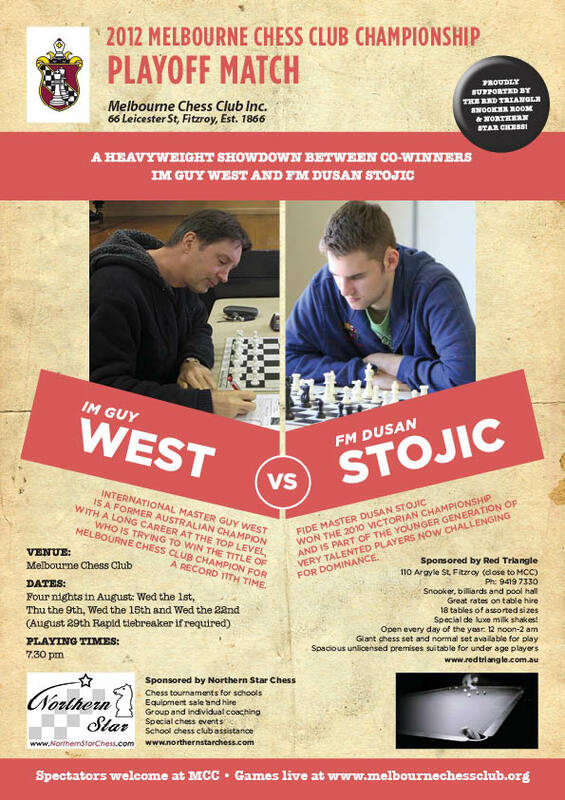 The Melbourne Chess Club has been holding a play off match for its Club Championship between IM Guy West and FM Dusan Stojic. These 2 ties for the Championship earlier in the year, and are now playing a 4 game match for the title. Tonight is the last game with the score standing at 2-1 in favour of Dusan Stojic. So a draw will guarantee Dusan the title, while a win for Guy will take the match into faster games play off. The game can be seen here, and I'll post it later. Well, it was a tense finale. Guy tried to unbalance the situation, but Dusan was always up to the task of countering Guy's threats. Perhaps there were some chances that Guy missed, but nothing so obvious or seemingly much better. So finally, Dusan came out the victor of the game, and the winner in the match and is the 2012 Melbourne Chess Club Champion.